A last note about our Italian trip. A big hello and a thanks to Marco Schiavone at EdizioniBD, our host, and publisher of Bacchus in Italy. The series is now complete in eight volumes. It's funny to think now, after having enjoyed the trip so much, that I was reluctant to go, having sworn off any more traveling for the near future. It was only that the wife of my bosom overheard the word 'Tuscany' and then there was no getting out of it. From Italy we went to the UK for a week. 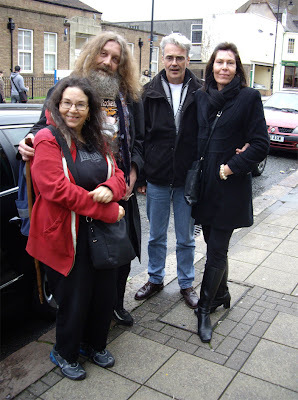 Here's a photo of Melinda Gebbie, Alan Moore, who became a grandfather a few days before, me and Anne in Northampton. Shows she was right about pushing the idea of the trip along. Great photo, Eddie. Thanks for sharing! That's one helluva great photo!!!! Whenever he's photoed in real life (as in, not being posed by journalist who wants to make him look spooky), I always think that Alan looks a bit like Father Christmas. Melinda's red hoodie only contributes to this delusion in this case. I love everyone in this photo.Creators of Lost Girls! From Hell! Eddie's lovely wife.Makes me smile.